The Baka decided that what they wanted the money from the charity to be spent on was a centre for their music in order have a home for their music. The Music House provides a centre point for the community to meet and perform. 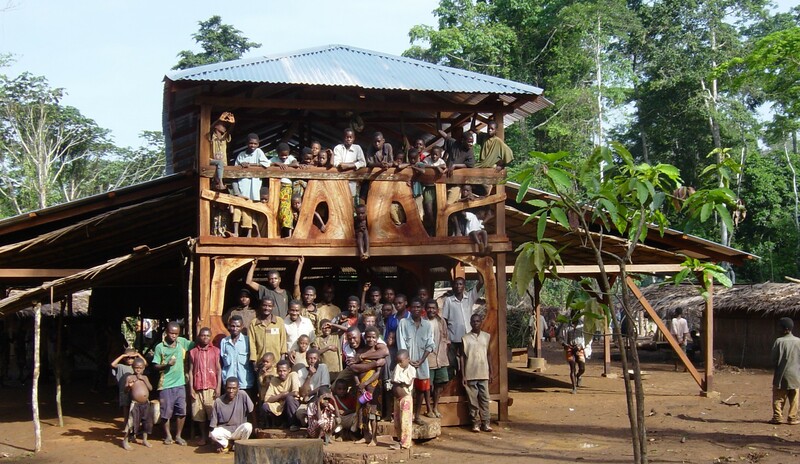 The Music House is more than a building, it is a physical symbol of their musical success showing the local people and the Baka they are due respect. On Martin Cradick’s trip to the Baka at the end of 2002 a mongolu music house was built, but he promised to return to help them build a larger music house in the village near the road. 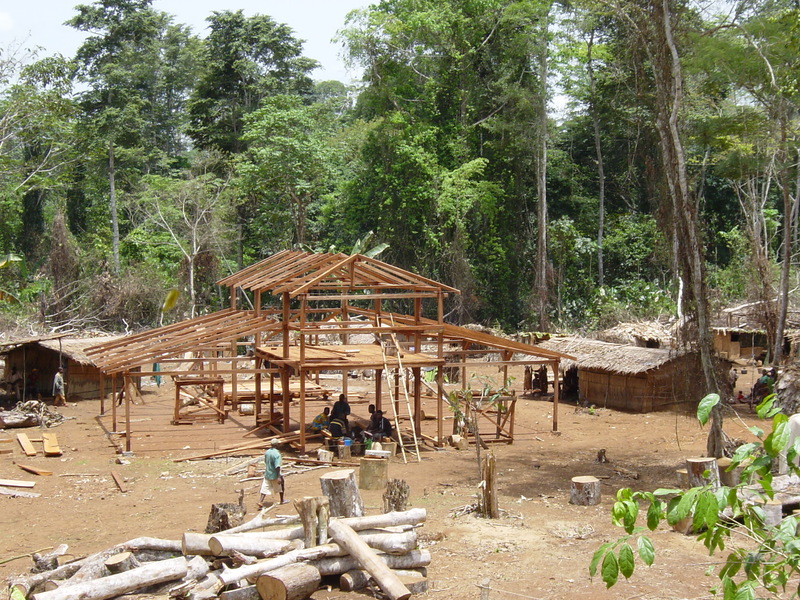 In February 2003 Martin arrived at Lupe with expert timber-framer Andi Main. They both showed up at the same time as the elephants arrived in the area. 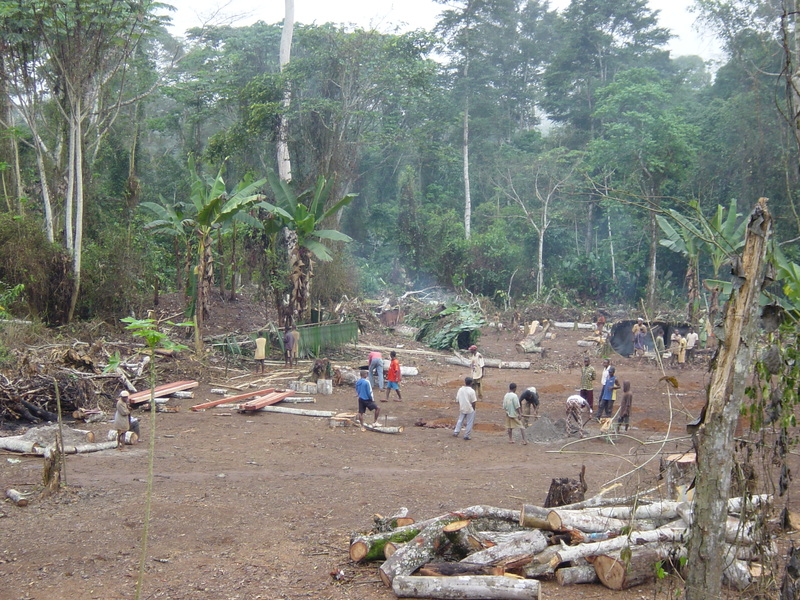 The Baka had to decide whether to follow the elephants that they had been waiting for, or to follow Martin and Andi to start work on the music house. They decided to go for the house. 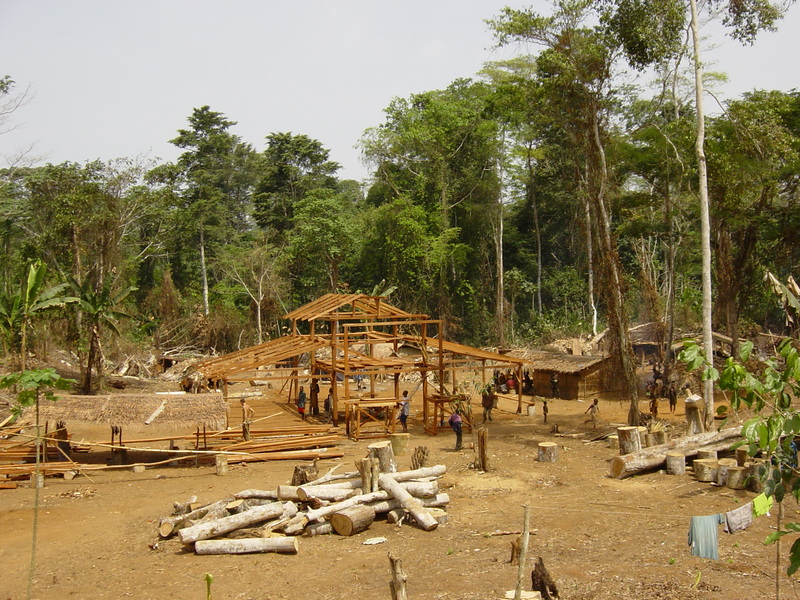 The chief of Banana (the local village) had allocated an area of land that could be used to build the music house. 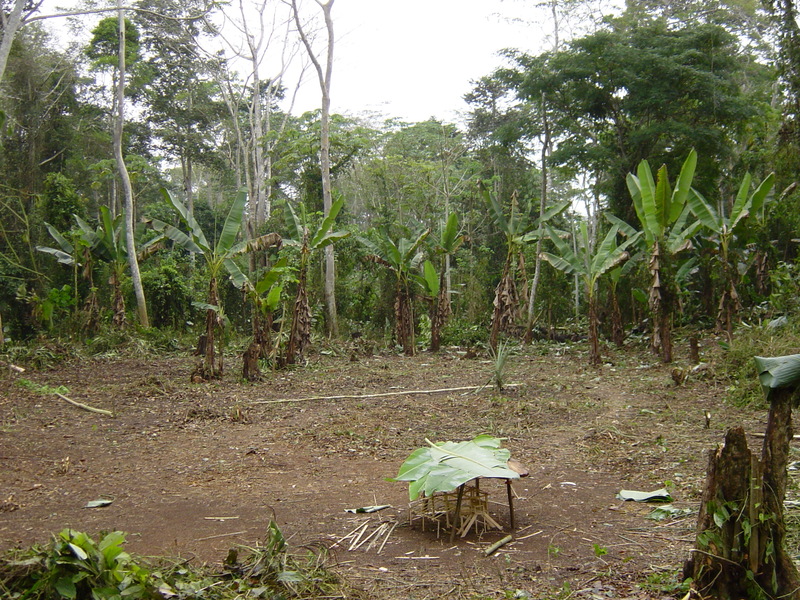 It had previously been used by some of the Baka as a plantation, but was now very overgrown. Looking at it we wondered if we were completely crazy to expect to be able to build the music house in four weeks. 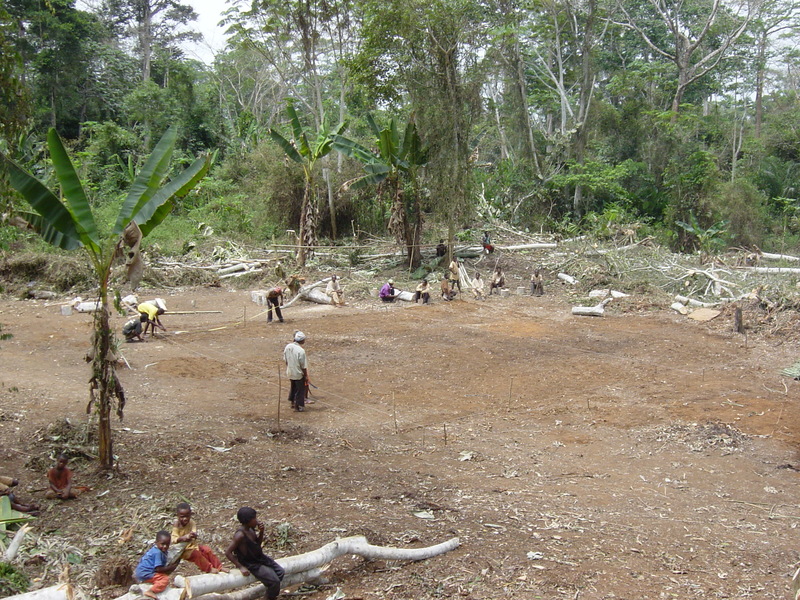 After the first day’s work we realised how quickly the Baka could work.Very soon a large area of what had appeared to be impenetrable undergrowth had been cleared. 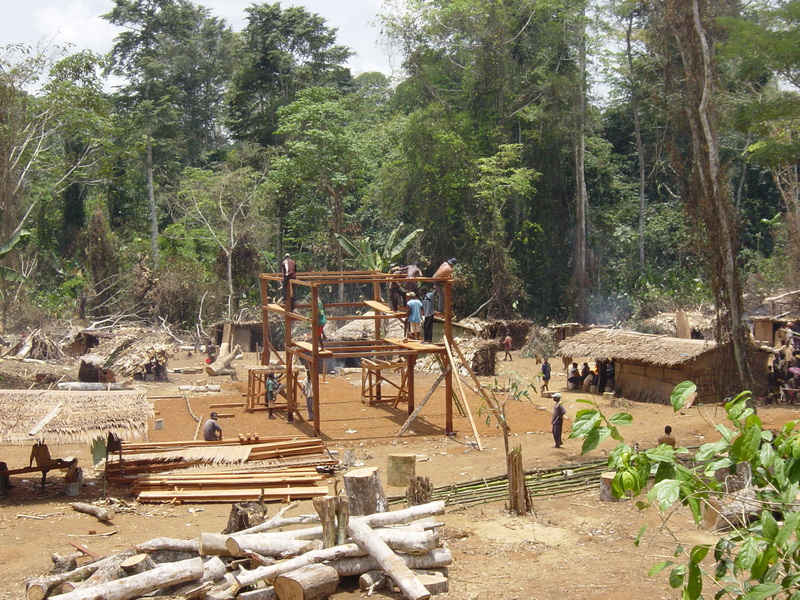 After the second day they started building a new village on site. 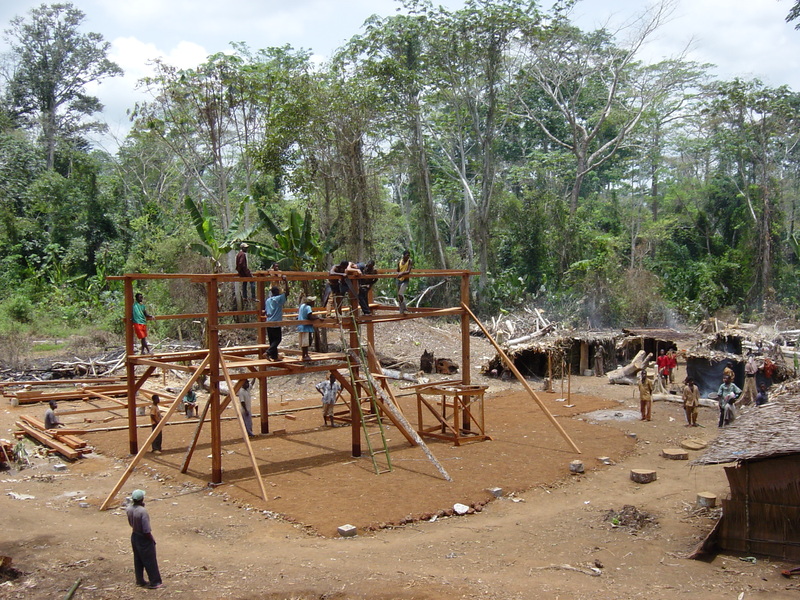 By the end of the first weeks work (actually only 4 mornings work – we started on a Wednesday and by midday it was getting too hot to work) the site of the building had been cleared and levelled and the foundations laid. 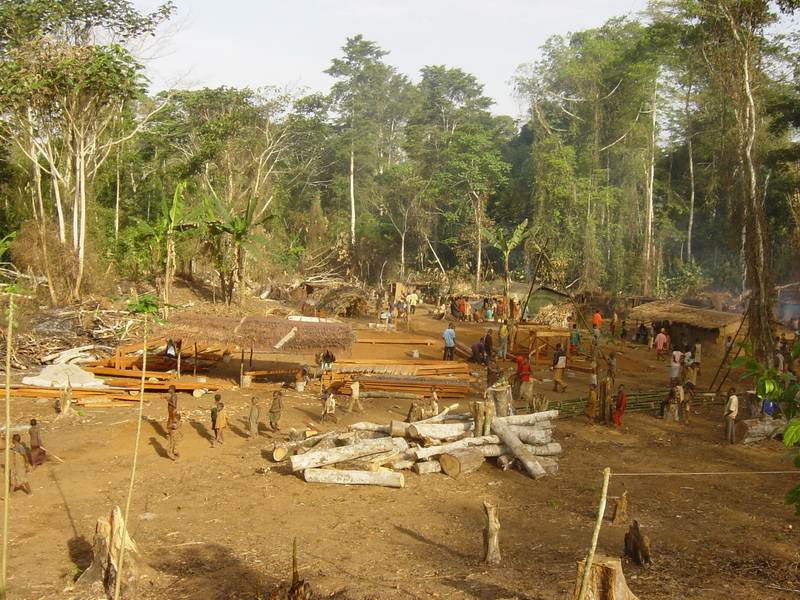 We obtained permission to cut down a single Sapele tree that would provide sufficient wood for the structure of the building. 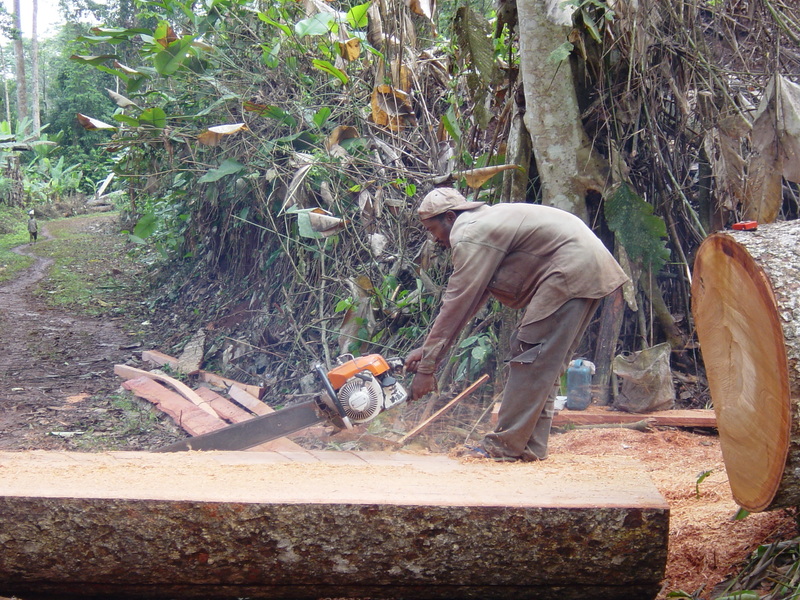 This was then expertly cut up into beams and planks by Theo, who lived in Kika, a logging town about 80km away. 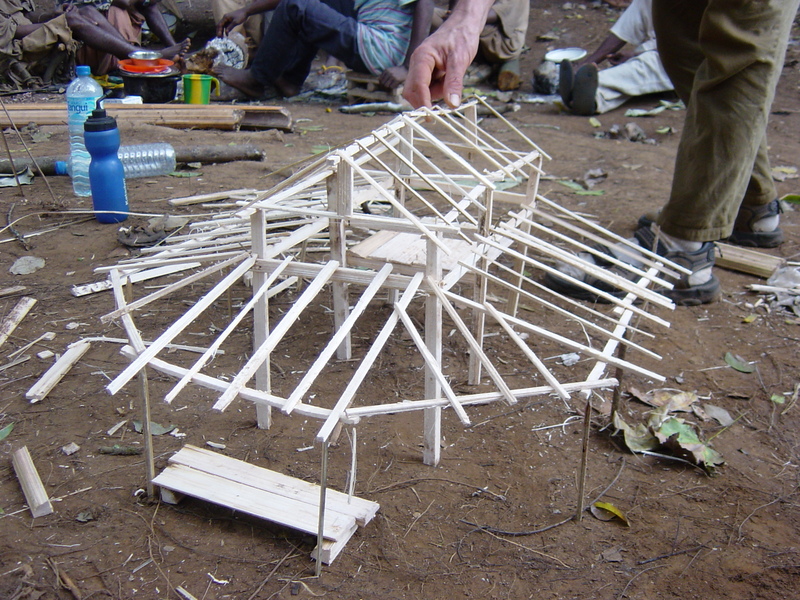 Andi taught both Baka and Bantu how to make tenon and mortice joints which they did using tools donated by the charity “Tools for Self Reliance”. 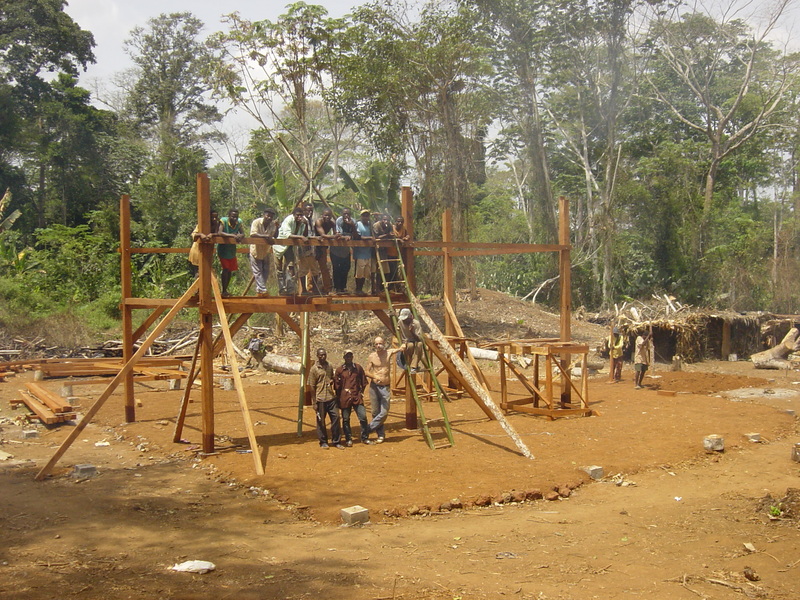 By the end of the second week the first pillars were erected. 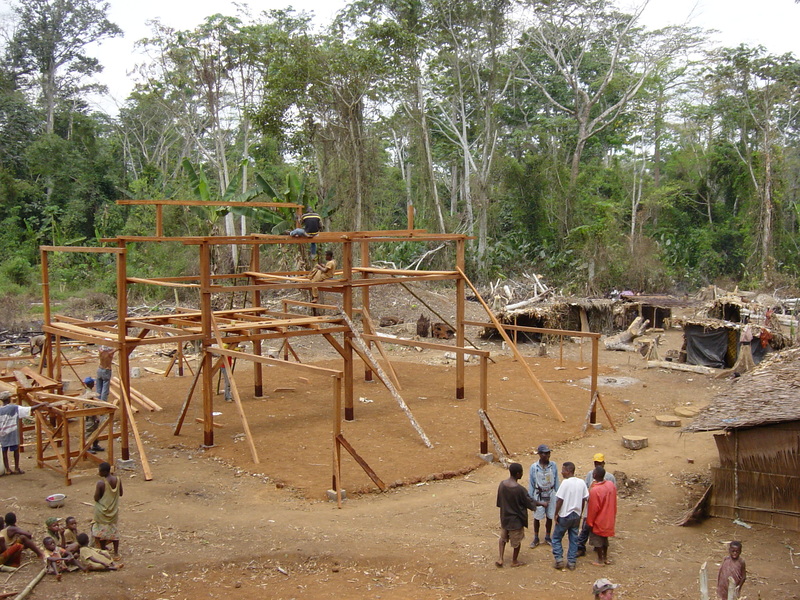 By the end of the third week the basic structure of the house was finished, all that was needed was a roof. The entire structure had been built from just the one tree! It was decided to cover it with corrugated aluminium with the traditional rafia palm material underneath that. This would give it the lasting quality of the metal roof with the coolness and ambience of the traditional roof. 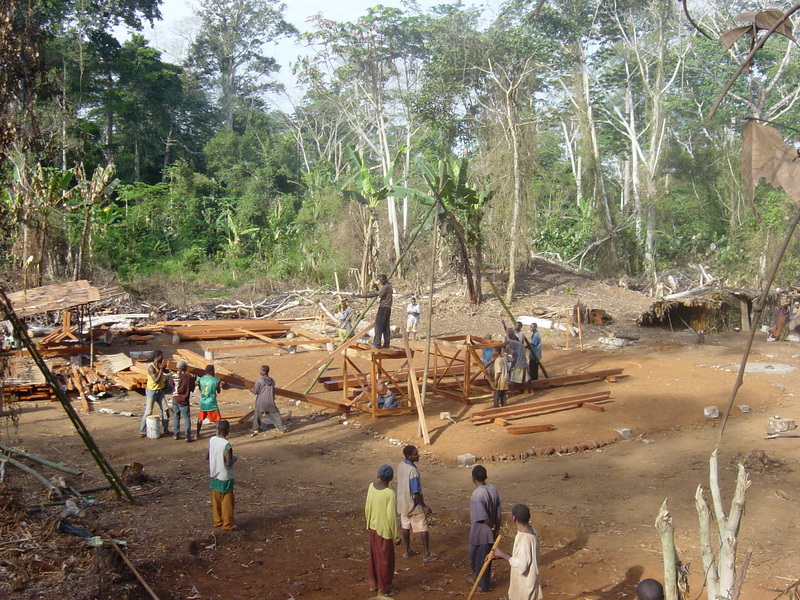 In order to attach a metal roof we needed some more lengths of wood which we bought in nearby Moloundu, rather than cutting another tree. Almost as soon as the roof was on it was tested by the very heavy rain that is normal in this region. As soon as there was a semblance of a building the space was tested by a succession of parties and performances. Even with no electricity it proved to be an inspiring space for music, dance and generally a good time. To improve the sound as well as the ambience of the space traditional rafia roofing was placed inside the roof. We used planks made from the higher branches of the tree behind the stage. The mats behind are made from the stems of the ngongo plants, the leaves of which are used to roof the traditional mongolu houses that the women build. 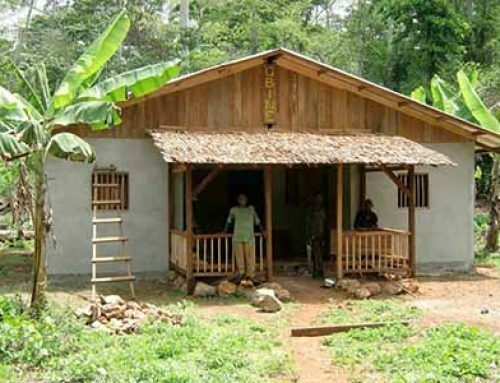 The basic construction of the house was now finished but there was more work to be done inside. The design is such that performances can take place on a stage with a dance floor in front of that and a raised platform at the back creating an amphitheatre feeling. Equally the performance can take place in the middle with seating all round. This would be more suitable for traditional dance performances. The music house has already been used to entertain local people and as a meeting house for the newly formed Baka association, “Gbine”. 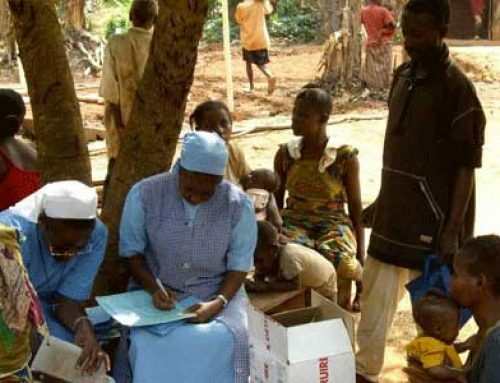 It provides a link for the Baka between their forest lifestyle, which is still strong, and there life interacting with the townsfolk of Moloundu and surrounding regions where development is creating more links to the modern world. 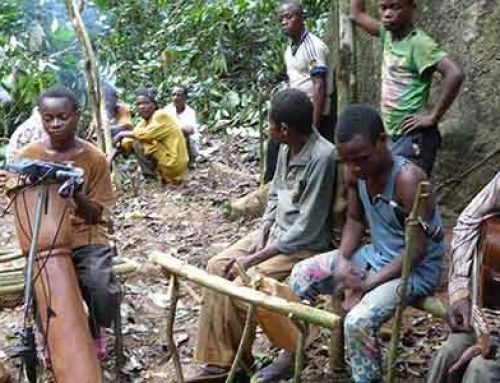 Their music and dance is developed in the forest and the music house provides a place for them to present this to the outside world and to increase their standing in the eyes of the village and town population who often dismiss them because of their “primitive” lifestyle. 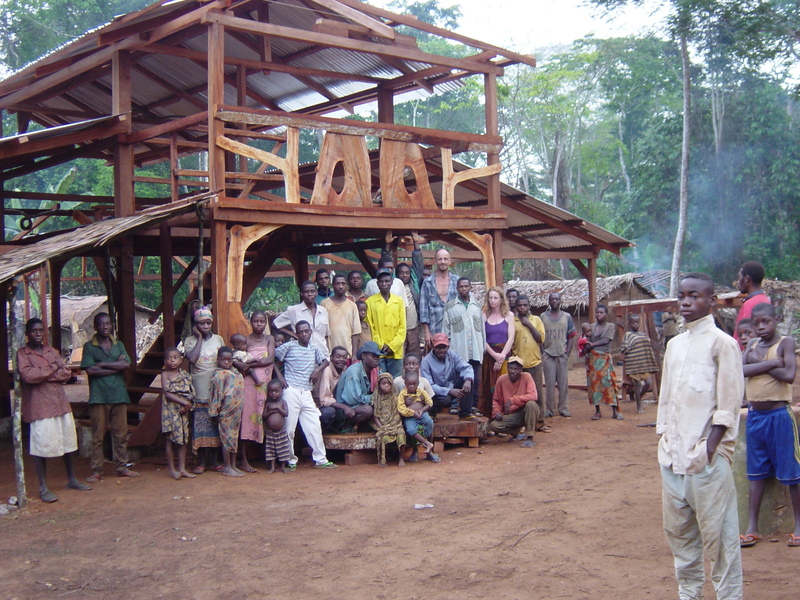 In January 2004 Martin Cradick and Andi Main returned to Cameroon to complete the Music House. It was all in good condition and the site had been kept clean and tidy. As well as some more tools, they had brought with them a new guitar for Mbeh and a solar panel so that Martin could do some more elaborate recordings. It was good to be back and playing music in the Music House again. Martin set up a studio a bit away from the site of the Music House so as not to be disturbed by the noise of the work. He had a set up that could record with 6 microphones at once and the first song he recorded is now on the Baka Beyond album, “Rhythm Tree”. A small leaf hut was quickly built to record from. 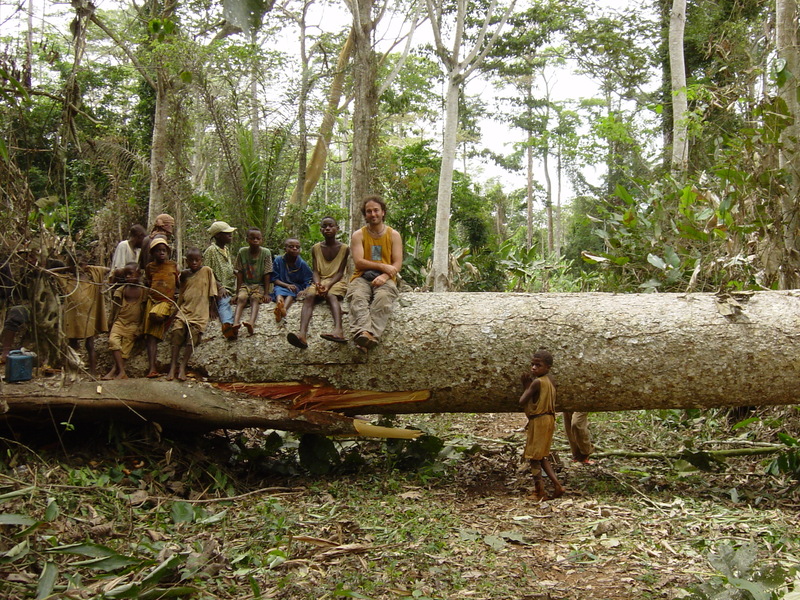 Another Sapele tree was felled to provide all the timber for the inside. Again Theodore was the expert chainsaw man who cut the tree into planks for the floor and stage. Andi designed the layout and several of the Baka were inspired to create their own additions such as the bench that Theodore is sitting on. 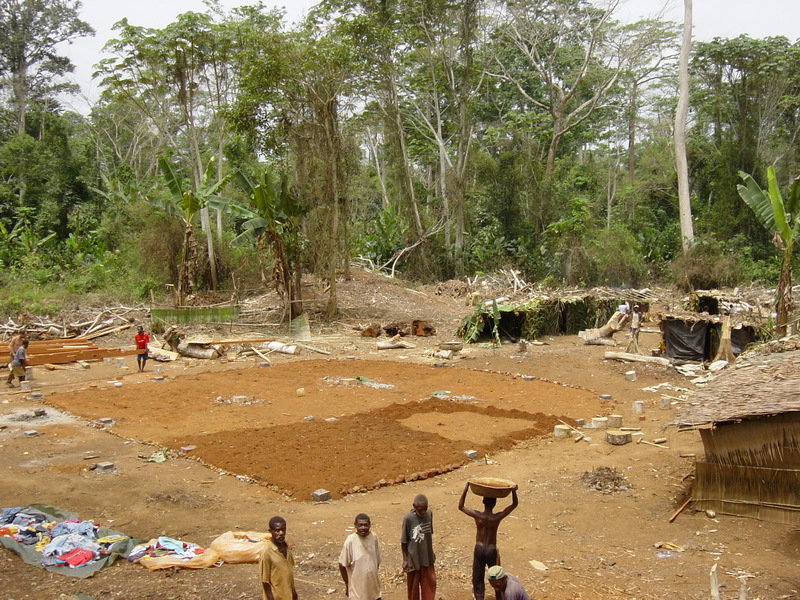 The local chief hired us a brick press so that bricks could be made on site from the earth. 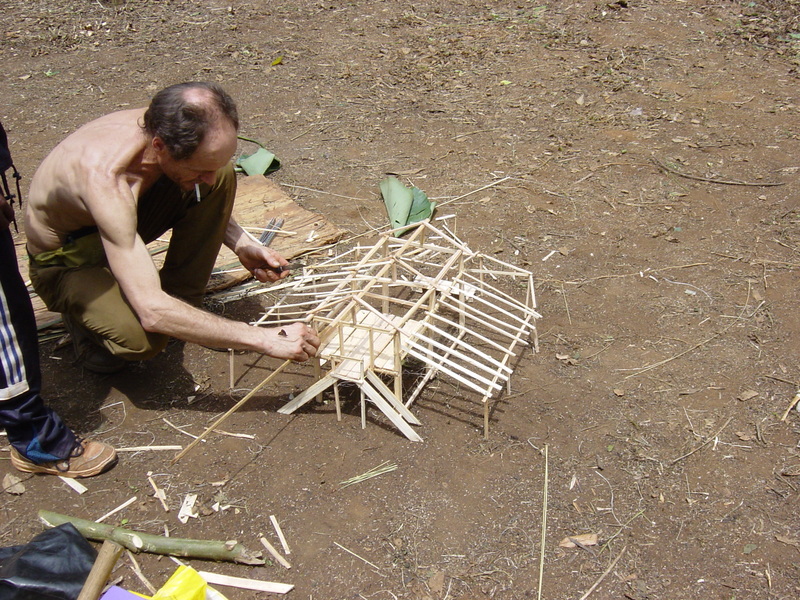 Hardwood poles were cut in the forest for the “windows” and by the time Andi and Martin were returning back to Yaounde, the capital, the house was complete. 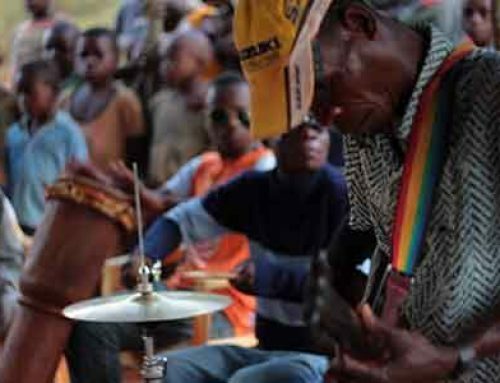 In the building of the Music House many Baka have learned useful skills that have enabled them to find work with other people. 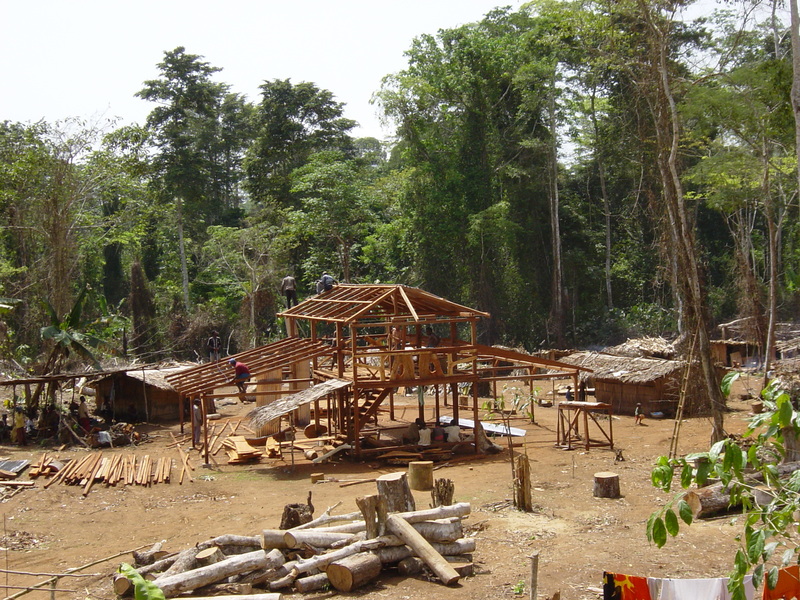 There is now a solid base that is owned by their association Gbine which can be used as a centre for many activities. On their way back to Yaounde and their flight to Europe, Martin and Andi took a group of 8 Baka musicians to play a concert in the garden of the British High Commissioner’s residence. 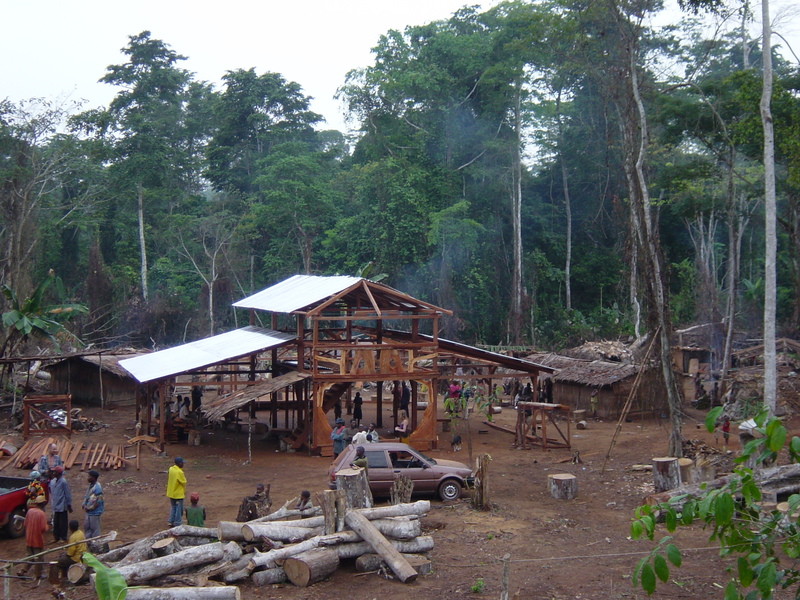 In spite of a terrible journey with a long detour through the rainforest due to a bridge having collapsed, and the vehicle breaking down several times, they all arrived with enough time to buy some clean clothes in the market before the concert. Some government ministers were present as well as the Cameroonian radio and television and everyone was very impressed both by the Baka’s music and by the way they presented themselves. Many good positive contacts were made for the future.